Spring is fickle here, one day flipflops, the next snow is falling once again! Such was the saga of the Easter weekend. It began with snow and worries of my daughter driving from another province and ended in warm sunshine with us hoisting lawn chairs up over the railing on my second floor deck! I have been busy sewing summery accessories with bird themes, birds are found on everything and I have a growing collection of them in my place. I decided to applique a pillow with so soft birds created from Xotic bamboo felt by National Nonwovens. 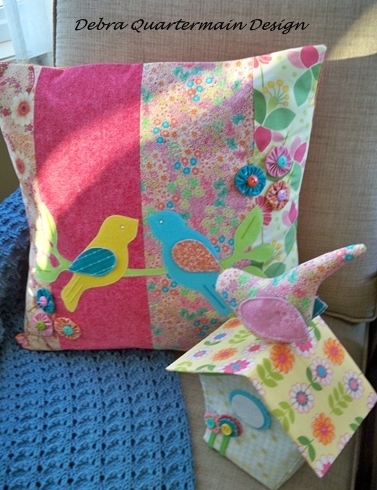 The fabric birdhouse compliments the pillow and will make a nice accent for a table next to the chair. Now if it will just stop raining this week.....Debra, CEO!